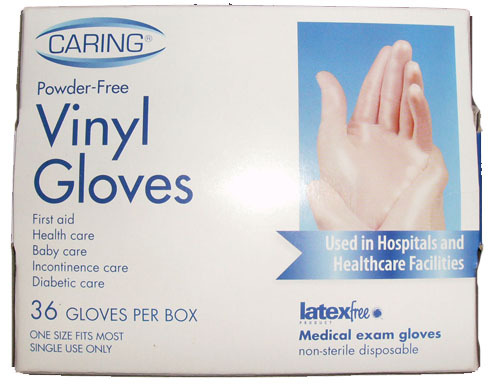 Stretch Vinyl Gloves "One Size Fits All"
The Stretch Vinyl Exam Glove is a durable vinyl exam glove that can be used for all sorts of tasks from It is Powder Free and Exam Medical Grade. The Stretch Vinyl is a "One Size Fits All" From Size: Small, Medium and Large. The best price to save you money is in Bulk by the Pallet. These Gloves Come 50 Cases to The Pallet.This glove is very easy to slip on and off because of it has an easy slip on polymer on the inside of the glove. STORAGE: In storage avoid excessive heat 40° Celsius / 104° Fahrenheit. A open box should be shielded from exposure to direct sun or fluorescent lighting and stored in a cool dry place. GloveSaver.com Offers our customers a quality brand name VINYL EXAM GLOVE guaranteed for 1 year with a 30 day no hassle money back guarantee . All of our gloves come 10 boxes to the case to save you money (unlike other internet companies who make you buy 20 boxes per case). 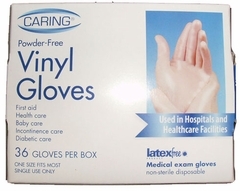 Shop with GloveSaver.com and see the difference in our Certified Vinyl Exam Gloves. * 50 or more Cases of Gloves = $23.50 per Case.